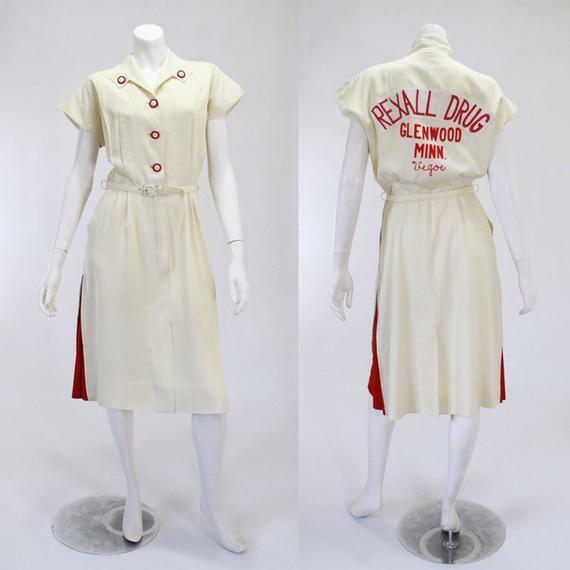 High on my list of things-I-must-have was a 1940s bowling dress. Now, thanks to the wonder that is Instagram, I have an excellent example of such a dress, brought to me by my newest favorite online vintage store, VeraciousVintageCo. As far as active sportswear and how it was adapted from fashionable attire is concerned, it does not get much better than this dress. If you were to only see the front of the dress, you very well might think i is just a fashionable day dress from 1946 or 47. But the back with the chain embroidered team information immediately tells us this one was made for bowling. 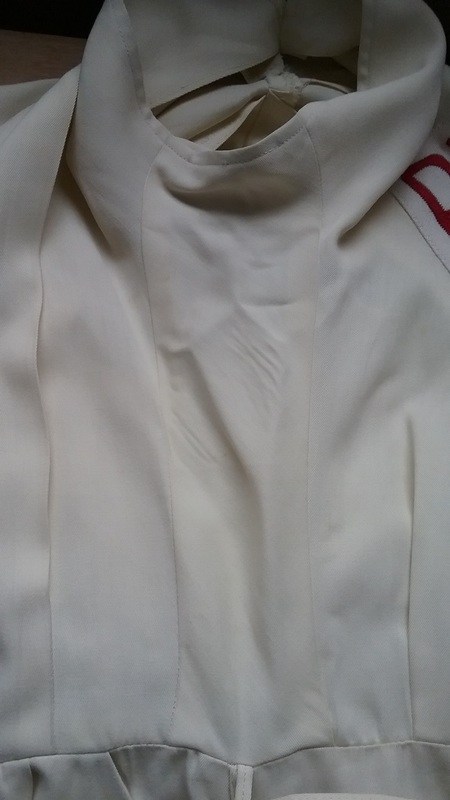 But more interesting are the features that the designer built into the dress to make it suitable for bowling. 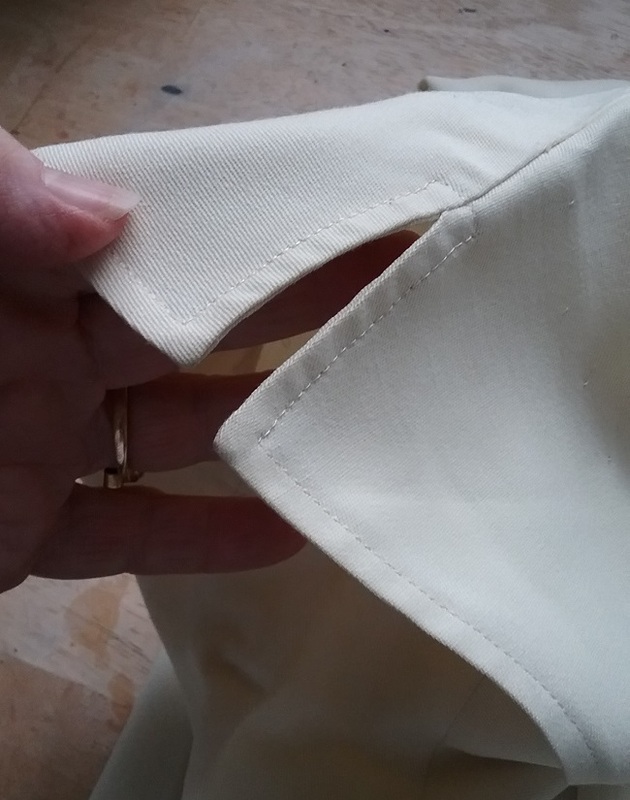 The cap sleeves are cut in one piece with the bodice, and for extra mobility the designer put a two-inch slit at the top of each one. 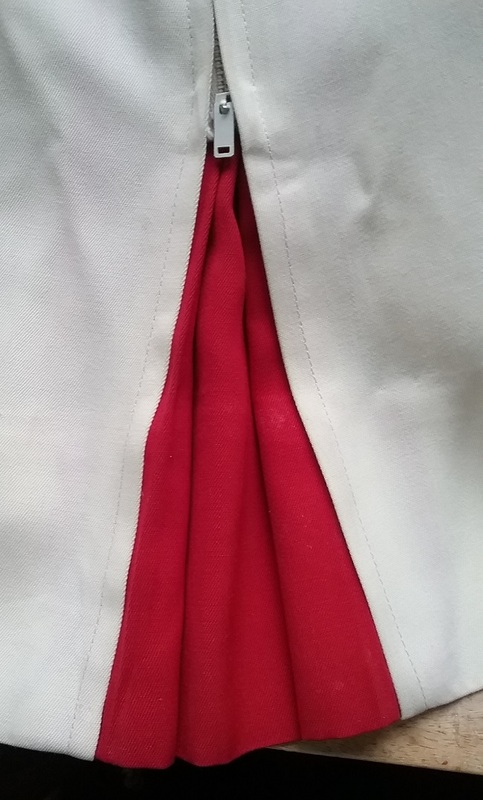 This one might be a bit hard to see, but it is a bias cut panel that goes from the waist to under the arm. Again, the purpose is to add the ability to move in the dress, as fabrics cut on the bias have a bit of stretch. But what really sold me on this dress were the red side pleats that can be increased in size with zippers. 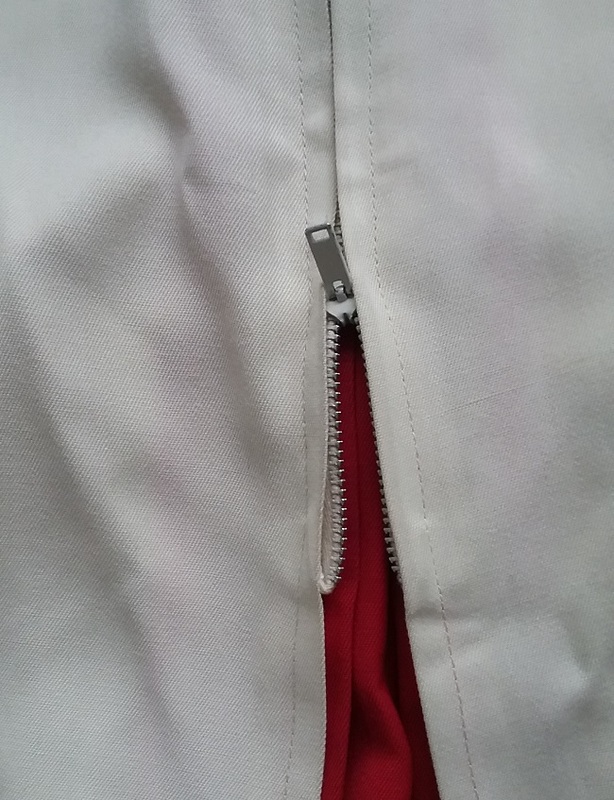 The zippers are nine inches long and zip up to add more fabric at the knees. When not playing, the wearer can zip them down for a trimmer look. Not only is the label nifty, it is very useful in helping us learn a bit about who made the dress. Note the little R in a circle mark. That means that the trademark was registered with the US Patent and Trademark Office. I looked up “Play Girl Fashions” and found no reference, but then I found the company under just “Play Girl”. According to the record, Play Girl dates to 1921 and was originally a line of girls’ dresses. 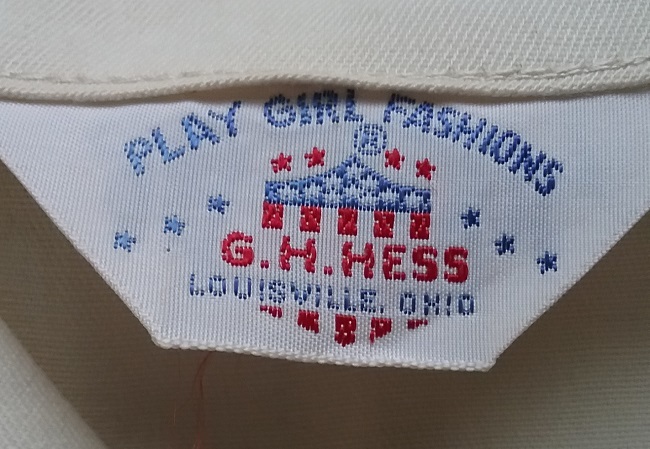 The trademark was owned by the United Garment Company of Louisville, Ohio. In 1921 G.H. Hess was, according to the 1940 US Census, twenty-six years old. It is possible that he owned or worked for United at that time, but there’s nothing in my quick research to confirm that. In the 1940 census he was listed as the president of a dress factory. There are lots of mentions of the company in trade publications throughout the 1940s and 50s, and there are also mentions of the factory in labor union publications, as the factory seems to have been unionized around 1954. The last reference I found to Play Girl Fashions was an ad for dresses in 1975. That year G.H. Hess would have been eighty years old. We can also learn much from the embroidery on the back of the dress. 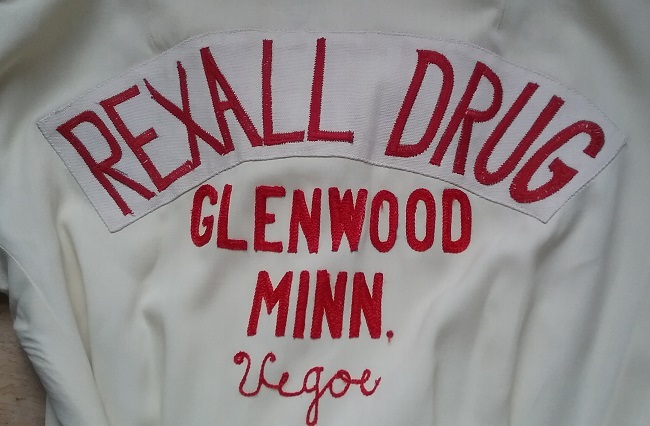 The team was sponsored by the Rexall Drug Store in Glenwood, Minnesota. 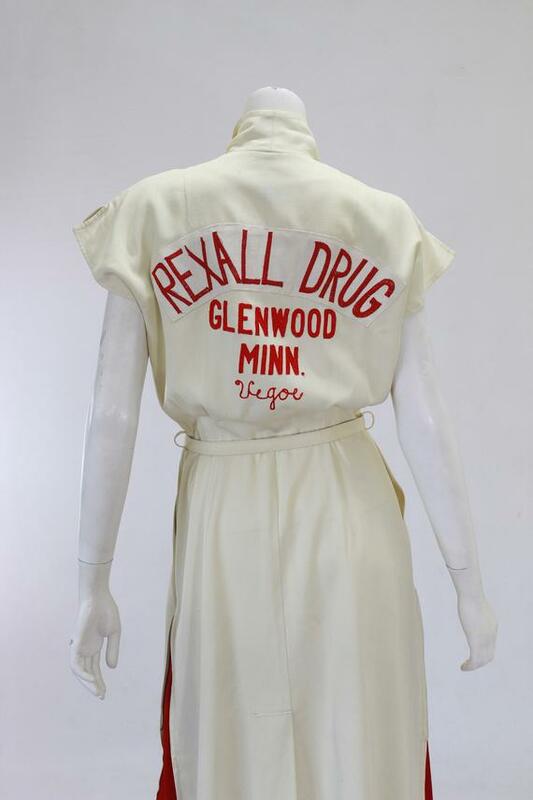 Note how the part that reads Rexall Drugs is slightly different in color. It’s a patch that covered up the original sponsor, Setter Drugs. I found plenty of references to Setter Drugs, which dates at least to 1928. Unfortunately this dress does not have the wearer’s first name on the front as we see so often on bowling dresses and shirts. But, we do know her last name, Vegoe. And there is one more hint. Leah of Veracious Vintage noticed that the wear’s initials, H.V.were inked on the back of the belt. Again, we hit a dead end. There is a Howard, and a Harold Vegoe, but none that we could find with a feminine name. So, help me out Vegoe family, up there in Minnesota. 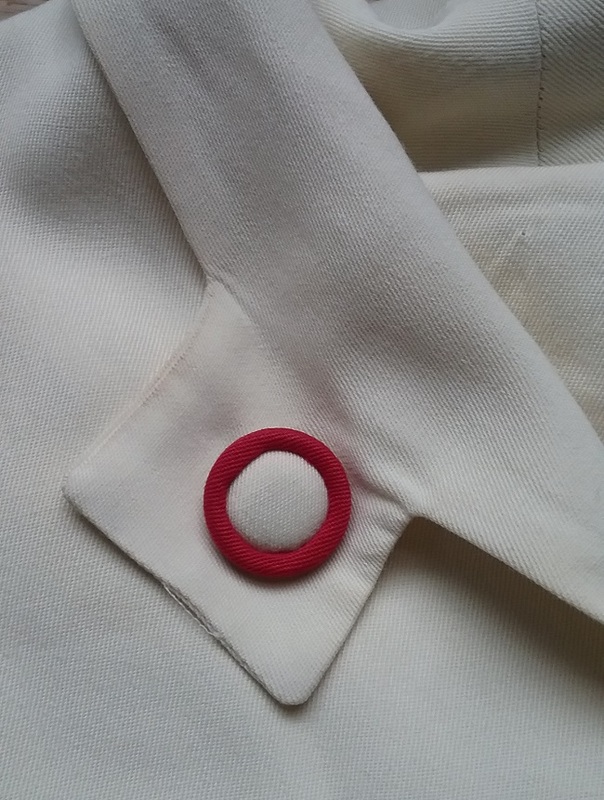 And check out the collar.